Our popular flagship Replenish 360 Palm Desert, California office is now available at your convenience for your IV hydration therapy, vitamin supplementation, and other wellness services close by the nearby cities of Palm Springs, Cathedral City, Rancho Mirage, Indian Wells, Indio, Desert Hot Springs, Idyllwild-Pine Cove, Coachella, Bermuda Dunes, La Quinta, Sun City, Thousand Palms, Redlands, Morongo Valley, Cabazon, Banning, Beaumont, Yucaipa, San Jacinto, Hemet, Temecula, Twentynine Palms, Yucca Valley, Big Bear Lake, Joshua Tree, Salton Sea, Brawley, El Centro, Blythe, Calexico, Borrego Springs, and Anza! Don’t have time for an IV infusion but need a much needed energy boost, pain relief for your headache and muscles, or just queasy from the weekend? Look no further and try our A La Carte Services! around the city of PALM DESERT? Look no further! Our mission statement is reflected in our motto above and it is what we always strive for whenever you come into our one-of-kind and relaxing IV Hydration Therapy and Wellness Clinic in certain cases when you may be sniffling and whimpering through a mild cold and flu with or without nausea and vomiting, the “runs” from a bug that you unfortunately caught after consumption of contaminated food, had a bit of a hangover from the once-in-a-lifetime party or special occasion you gladly experienced the night before, a competitive athlete who needs to boost their performance and recovery with IV hydration post-intense workout, or just worn out because of a red-eye jet lag and you have not had the chance to drink enough water and nutrients throughout your busy schedule and the days work. These are small but prime examples of different types of sometimes unavoidable life occurrences which may not be averted entirely and may probably lead to your mild to moderate dehydration and the sequelae of uncomfortable signs and symptoms stemming from the lack of daily oral water and vitamin intake. 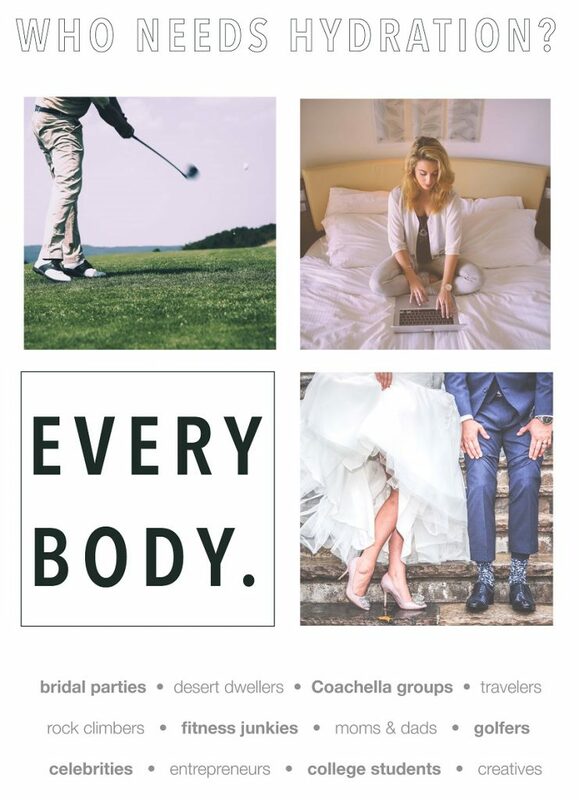 We want to be your service and facility of choice for your hydration and wellness needs not only in our state-of-the-art and tranquil IV Hydration Therapy and Wellness Clinic but also at the comfort of your own home or hotel room; your special personal events such as weddings, Bar Mitzvahs, birthdays, and other special life celebrations; public events like the infamous Coachella Festival, Stagecoach, Desert Trip, and other hot music festivals and concerts; your local bars, pubs, taverns, night clubs, dance clubs, and other entertainment venues; and immersed in sporting events at your native gym or in your football, basketball, soccer, baseball, tennis, golf practices, tournaments and games! Everyone is so kind and welcoming! I love IV therapy and so glad I can get this service outside of my natural doctors office anytime I feel I need it!! I am a very happy and feel great! This place is amazing. My brother in law was badly dehydrated and wanted to call an ambulance. We found this place and tried it first. We saved $500 on a hospital trip. I tried it also because I was curious and had a hangover. I tried the saline with vitamins (I think Myers blend) and left feeling great. I’ll be back during festival season and will def do it again. I’d like to try it when not hungover to see if there is still a boost because the difference was huge. Replenish 360 was my first IV experience apart from the hospital. Besides a good cheeseburger and hair on the dog, I heard that IV therapy was a great, clean way to cure yourself of a hangover. I was in town for a wedding, had a little too much and desperately needed relief, having a lot to do the next day. I found Replenish 360 through a simple Google search. I gave them a call, came into their facility on a weekend, and they treated me with a so called “banana bag” and was given some headache medicine. An hour or two later, it was like the wedding and all the drinking never happened. If you are in the area and in need of this relief, I highly recommend giving them a call and paying a visit. I’m convinced hiring Replenish 360 is amongst the best decisions I’ve ever made. I called the morning of my wedding to mitigate a moderate to advanced hangover. Deep head and neck aches, dehydration, body aches. We were on a sustained good mezcal / mediocre beer program the night prior. Two wonderful nurses came to me poolside whilst enjoying huevos rancheros and having our friends trespass to the private pool of our adorable little hotel. They told me the scoop, plugged me in, and we began the 45min road to recovery. There was no pain. You start feeling better about 20 mins in. The full flight takes about 4 hours to get to cruising altitude where you will find yourself 100% replenished. The vitamin, pain reliever, and saline cocktail is delicious. This is a steep ticket show, no doubt. But look, if you’ve got the big day / meeting / event etc… this is an investment in yourself. Very big returns. I’m just thrilled that the nurses and service we received was all so easy, helpful, and fun. This place is awesome! The staff is great and super communicative. I recommend the Meyers cocktail after a night of drinking. I came with my brother in law who wanted to call an ambulance because he was dehydrated. We found this place and saved $500. I’ll be back. A GREAT EXPERIENCE!! Let me just say that I hate being poked. I’ve always been pretty squeamish when it came to needles. I was a little hesitant but have been wanting to get IV Hydration for a while to see what the hype was about. I called them up and let them know I was in town with my husband and a few friends who wanted to get IV therapy. They said they were able to come to us and have it done in our hotel room! So awesome. We scheduled for the next morning. The staff was so friendly and very professional. They are all certified/licensed nurses and medical professionals so they know what they’re doing. My husband and I both went with Tier 3. We were able to get hydrated while we relaxed! It was an overall positive experience and I would definitely do it again! "Renew the body, refresh the mind, and restore performance"
Replenish 360 - Palm Desert Resuscitation Education, LLC. All rights reserved.